A brief preface describes the nature of logic, mentions some background information from previous works, and suggests that the logic as explained is simpler. 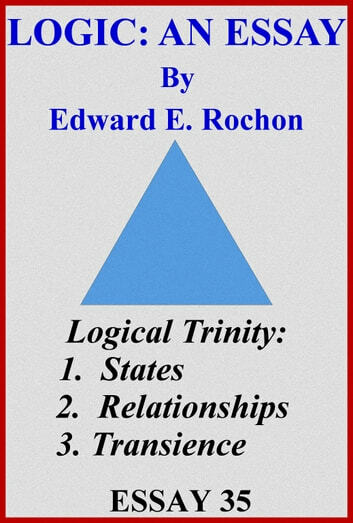 Chapter 1 deals with logical states: states, relationships and transients. It describes their attributes. States are things; relationships speaks for itself and relates states to each other; transience is the process of thinking and predicate to those states called events. Chapter 2 discusses the nature of states as eternal. It discusses axioms and the nature of universals that are needed to define states of existence. Much of this comes from previous works of mine. Chapter 3 briefly mentions that probability is not a true math but is a valid predicate for logic when its assumptive nature is understood. Chapter 4 discusses time that relates to immanence in contradistinction to time. It deals with 'a priori' and 'a posteriori' conceptions of the basis of reason and logic. It is noted that time and eternity must coexist, that treating logic as 'a priori' knowledge is pointless since eternal truth is immanent in existence, an existence that includes nature, the brain and the mind as treated separate from nature or not. Chapter 5 discusses the method of logic by using an equation and a syllogism. The nature of reason is again touched on as was previously done in the preceding chapter. 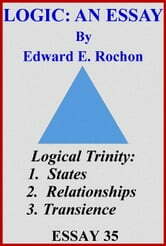 Chapter 6 summarizes the conclusions: of a three step process of logic. It notes that there are problems with logic, that treating life in a Sisyphean manner will not help the matter, that this attitude is Sisyphean in itself and so pointless.